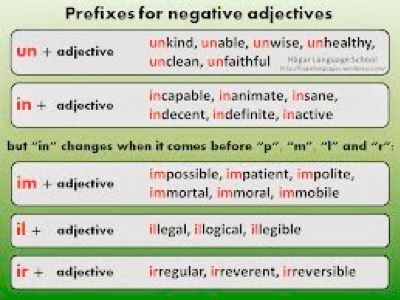 We construct many negatives with prefixes, dis- mis- anti- and some which start with the letter i. Of these, the following letter is a double, ill- or imm-, or imp-, or it defaults to in-. There are a few exceptions, such as ignoble. (I found no more). The meaning of the word is contrary to that of the foundation word; sometimes that is different from a mere negative or lack. IMM- immaterial, imperfect, impossible, immutable, immortal, immoral, immodest, immoderate, immobile, immitigate, immedicable immaculate, immotile, immovable, immutable, immiscible, immediate (look it up), impartible, impassable, impecunious, imparity, impenetrable, imperfect, impartial, impenitent, imperforate, impermissible, impervious, impiety, impolite, impotent, impractical, improbable, improper, improvident, impunity. But exceptions to the implied rules exist. Here the prefix acts instead as an intensifier (whatever the property, it is more so); some of these are more common in this form than their associate. There are of course some words which fit neither case, some of which are worth having their etymology explored (by you). impark, impala, impeach, impede, impetuous, , imperial, implode, import, impose, impostor, impugn, irradiate, irrupt, irritate, Illinois. Uncial, unciform (uncus, ungual,etc), unction, unctuous, undine, undulant, unguis (hence ungulate unguiculate, unguent, unless, until, unto. Of these, we generally use until in writing (and more so at the start of sentences) but till in speech. My immediate family likes to use couth, the opposite of uncouth, both of which are in the dictionary; unless comes from an on-less construction very like the if-then construction we use so much, and unto similarly comes from on to. Undulant and undulate are from the root unda, a wave. Unguis and the similar word uncus, is a hook or claw and hence we have ungulate, unguiculate, ungulant, unciform, ungula. This begs the contrary gulant to mean lacking in hooks, claws and fingernails, but it doesn’t yet exist. An undine is not being sick, but a water nymph. Words where the language has moved on, such as antipasto should be ante-pasto, before the meal; blame the transfer between languages. DIS- meaning negation, invalidation or deprivation, sometimes to send in many directions, follows the same pattern. Words where the language has moved on, some of which have been listed already such as disaster and discalced. Dispel (as with impel and expel, the –pel is pushing like –ject is throwing); dispense and disperse similarly. I want crimination and tinguish back, to fail to detect differences and cretion, for those foot-in-the-mouth moments; cussion, for those interminable meetings that have no content and are only worthy of swearing about afterwards—of course, we could argue that cuss, to swear, is the antipathy of polite discussion. Similarly sheveled, for tidily dressed; mantling and membering, putting things back together (Frankenstein was membered]. Missal is (or should be) the process of becoming employed, receiving the letter of appointment. Sippation should be much the same as prudence, comportment, temperance, and other forms of sensible behaviour. A tinguished gathering should be one where everyone looks the same, but not uniform. I want to be seen as traught, calm when all about are shouting and screaming, perhaps at a pop concert. A local trict would surely be one of those vague areas that fall between recognised places, especially in London where adjacent names have different cash values on property. I’m going to start using calced when describing someone wearing slippers, having looked under C.
MIS- meaning error or wrongness, badness or impropriety, unsuitability and failure. miscegenation (cegenation…..? ), miscellaneous, miscible; miser, misericord, mischief, miss, mistress, missus; missal (for the Mass), mission, missive (miss-, to send); mist, mistletoe, mistral (foreign word). It would be fun to have cegenation to mean breeding for purity of line (think dogs, not people, please); cellany for every collection of things that are very similar; erable might be suitable for the occasions when a film makes you cry, you’re not miserable, nor hugely happy, but something different—perhaps all inappropriate apparent misery. Mistress implies that, of course, this woman has her hair mussed, while the other one, the tress, doesn’t. The reintroduction of, or forced obedience to, a rule has to be ericord, such as when Ramadan is followed properly near the arctic circle (a very short night). NON- implies simple negation and is so less forceful that the others above. the collection of words beginning non- includes those starting nona- (nine,hence nonagon, nones, nonuple) and we have a few residual words in the dictionary, nonce, none, nonchalant That last, nonchalant, s the only word I spotted that implies a lost word, chalant, to be concerned, not indifferent. amoral, acotyledon, acentric, acellular, achromic, acyclic, agamete, agenesis, agonic (no angle), agrapha (not in the Bible), ament (no brains), apathetic (meaning loss from a&pathos), apetalous, aphasia, aphonia, aphotic, astatic, atheism, atonic, avirulent, azygous.